When your xenon headlights start to dim, turn purple, or just burn out, it’s hard to tell what product to replace them with. Luckily, we have tested nearly every product on the market including Philips and OSRAM, in order to determine the best replacement you should go with, and if the higher cost is worth the money. 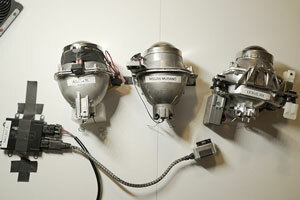 For this test lineup, we used a 35W Morimoto XB Ballast for all tests to keep things consistent. We tested the lumens, and more importantly the peak lux in 3 unique OE projectors at 25 feet. To find out more about our testing and samples numbers click here. We not only tested the major brands from Philips and OSRAM, but also some other popular premium brands, as well as a good amount of Amazon options to see how they stack up. We were very surprised by the results, so let’s get into it. Remember that you can always jump right over to the top recommended products page by clicking here. We keep that page up to date as we test, so you’ll always find the best products long after this article was written. You may tell yourself, well I’ll just replace the original bulbs with the same thing. They were bright, and lasted a while. Well not so fast, while that is a good option, there are much brighter options at a lower cost. Other benefits include an increase in the color temperature, to get a whiter output to replace the yellowish OEM bulbs. 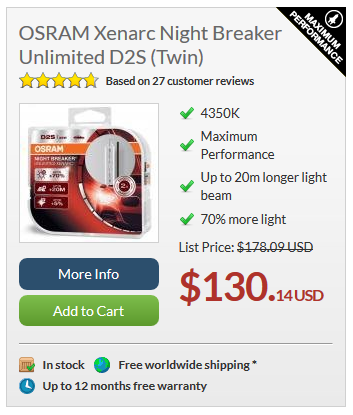 First up is the OSRAM Night Breaker Unlimited (NBU) set. These are our best overall brand name upgrade and come in about $30 more than OEM at around $110 typically (after discounts). Keep in mind the prices we are mentioning here are based on the D2S size, and the D1S, D3S, and so on will typically cost a bit more. The Unlimited’s offer 5% more lumens total over stock, but an incredible 26% more light when running in the low-beam setting, and about 7% when you turn on the high-beams. 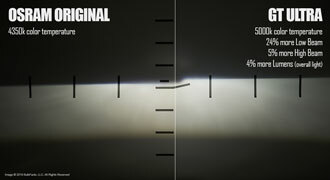 The color temperature tested was about 4450k, only 100 kelvin over stock of 4350k. About 2% more white, so a very small bump in color. Overall the best upgrade if you want to stick with the major brands. But what about the newer Night Breaker Laser Next Gen? These beat that kit, but marginally. The benefit to the Lasers is the higher color temperature of 4750k, closer to a pure white vs. the OEM color of the Unlimiteds. The Lasers run a bit higher in price as well of around $130 (after discounts). Here is a link to buy the Laser's. 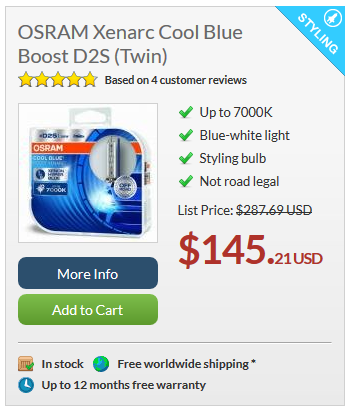 The next product by OSRAM is the Cool Blue Boost (CBB). It’s tough to get such high marks with a higher kelvin bulb, but OSRAM nailed it with this one. 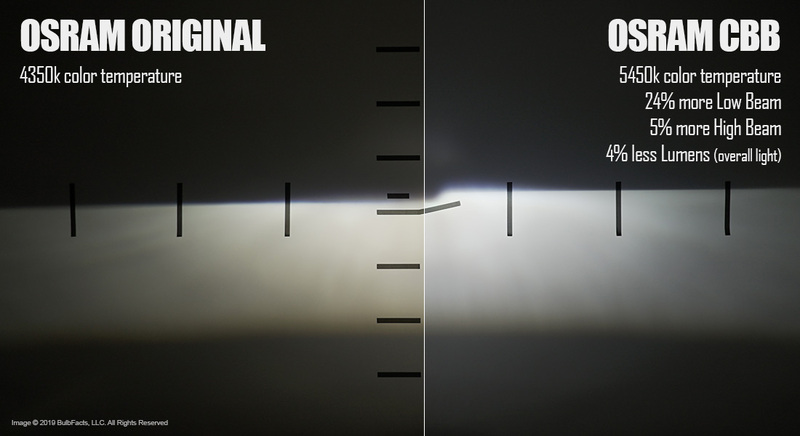 The CBBs have 4% less lumens, but that is indicative of the color. The peak brightness in low-beams is 24%, and high-beams are 5% over stock, only 2% in both regards less than the Unlimiteds. Now knowing they are a great upgrade in terms of brightness, the color is really where the shine at 5450k, a nice pure white color with no yellow, and a small hint of blue. They are our best color upgrade recommendation, and come in around $130 (after discounts). Just be sure if you do pick up a set of the major or premium brands, be sure to use the links from our website as you’ll ensure a genuine product. There aren’t many companies out there that actually sell a genuine product, and everything you find online including Amazon and eBay are over 80% faked. While the fake product looks the part, they don’t play the part. The real deals will have rare salts included for the best brightness and efficiency, precision alignment, and quality glass. All these elements make for the true perfect product that performs very well. Philips and OSRAM offer genuine validation, so be sure to check the pages if you picked up one of their models. We’ll post links in the description. Now on to the 3rd Party Premium and Amazon options. Although we haven’t tested the life of the bulbs as of this video, one thing to keep in mind is that the OSRAM and Philips bulbs will typically last the longest, with the 3rd party premium brands lasting a long time still, and the Amazon bulbs having much shorter life. Once we perform bench testing though, we’ll be sure to post the results on our website. We purchased the 5 most popular premium models from what we researched, and one stuck out far from the rest. The GT Ultra Xenons. They ranked about the same as OE in the lumens (due to the higher color) but were an astonishing 31% brighter in the low beams, and 10% in the high beams. Our color meter rated them at 5000k even, pretty far off from their 4300k claimed rating, but we can’t complain, as the 5000k produces a nice pure white color. Nothing else comes close at that brightness. On top of all that, they are under $50 shipped making them the best overall quality budget buy. They’re available in the major sizes, but lack a D4S size unfortunately if your looking for that one. Now onto the Amazon options. We don’t normally recommend buying HID bulbs from Amazon, but there were some great contenders, once in particular that stood out on top of anything we tested. Just keep in mind again that the Amazon bulbs will not be nearly as high of quality like the others we mentioned, but if you’re on a strict budget, they are a great option to get you by for a while. 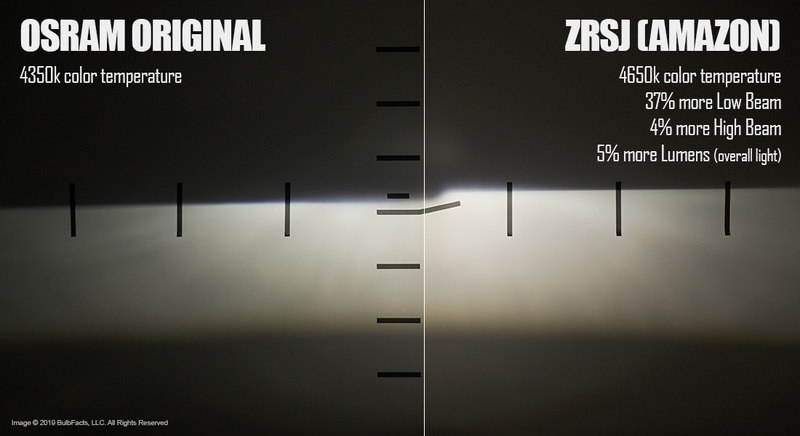 We went through 14 products from Amazon, and the ZRSJ ranked #1 at 5% more lumens, and a crazy 37% more low-beam brightness, and 4% more high-beam light. They have the correct alignment tabs as well, which some Amazon models were lacking, and it showed during out tests. They did not produce any flicker like some others, both during burn-in and the various bench tests. The color is closer to OEM, but a bit whiter at 4650k, a small bump if you want a whiter bulb. 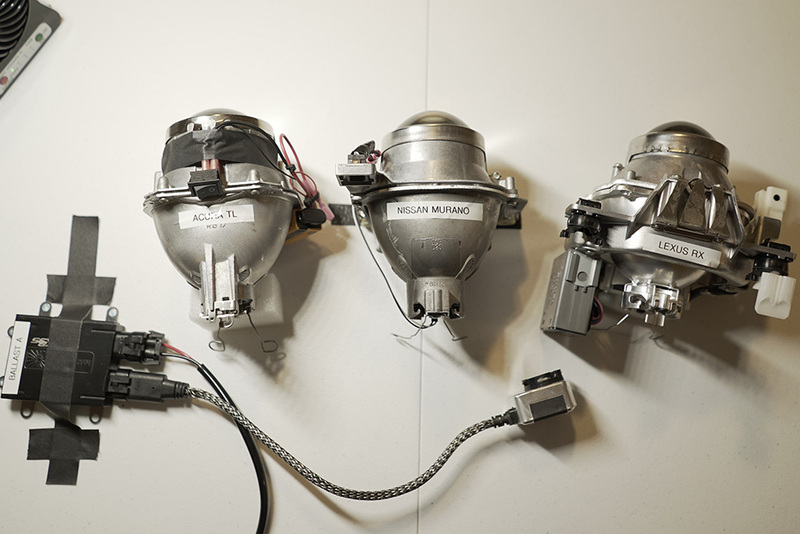 These were also the ONLY product from Amazon that produced more light in the high-beams over stock, all the others were less bright. At a cost of under $20, you can’t go wrong! Check them out, here is a link. Wait why didn’t I mention LED? 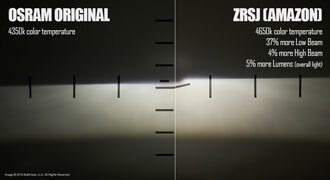 Well we have only tested one LED replacement product, and it didn’t fair well. 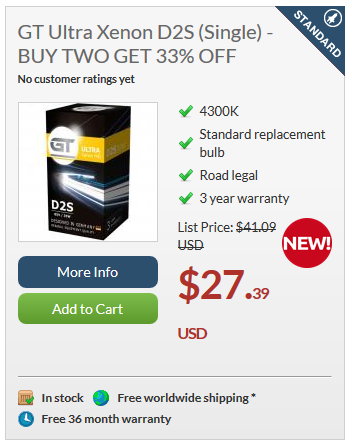 It’ll net you about half the brightness of a proper HID bulb, at a cost of over $100. Not worth bothering with. As LED advances though we’ll be testing more LED products to see if they can compete, but for now it’s best to stay with HID as the projector (or reflector in some areas) is designed for. Well that’s it, we hope this was of value to selecting the very best lighting product for your vehicle. Be sure to bookmark this page so you can refer back to it in the future if you’re not yet ready for the upgrade, and be sure to subscribe to our YouTube channel so you don’t miss any of our upcoming videos. We don’t release videos often, but when we do, we want them to be worth it. Stay up to date with our Latest Testing & News! 2019 © Bulb Facts LLC. All Rights Reserved. All logos and trademarks are a copyright of their respectable owners. *Please review our Terms & Conditions before viewing any results on this page. All data is Copyright BulbFacts and may not be used without permission of BulbFacts. We are a participant in the Amazon Services LLC Associates Program, eBay Inc. Partner Network, and PowerBulbs Affiliate Program, affiliate advertising programs designed to provide a means for us to earn fees by linking to Amazon.com, eBay.com, and other affiliated websites.